The Census Bureau released figures for new home sales in June. Sales of new single family houses were at a seasonally adjusted annual pace of 406 thousand, down from a downwardly revised pace of 442 thousand in May. The June sales pace was disappointing but not a disaster. The May pace, even after revision, was a surprise on the high side so the slowdown represents a return to trend rather than a change of direction. We expect sales to firm up in the second half of the year as the labor market and broader economy gain strength. A little perspective helps to put today’s numbers in context. The upward trajectory of 2012 and 2013 was replaced by volatility as the interest rate spike in the second half of 2013 and then the harsh winter in early 2014 pushed the numbers up and down, but the underlying trend has remained upward. It’s also worth noting that the Housing Market Index (HMI), a measure of builder sentiment, has moved up in recent months, with the strongest component being expectations for sales in the upcoming six months. These factors suggest that despite the monthly volatility in the numbers, the housing market recovery will continue at a steady pace, gaining strength as the job market and economy improve. 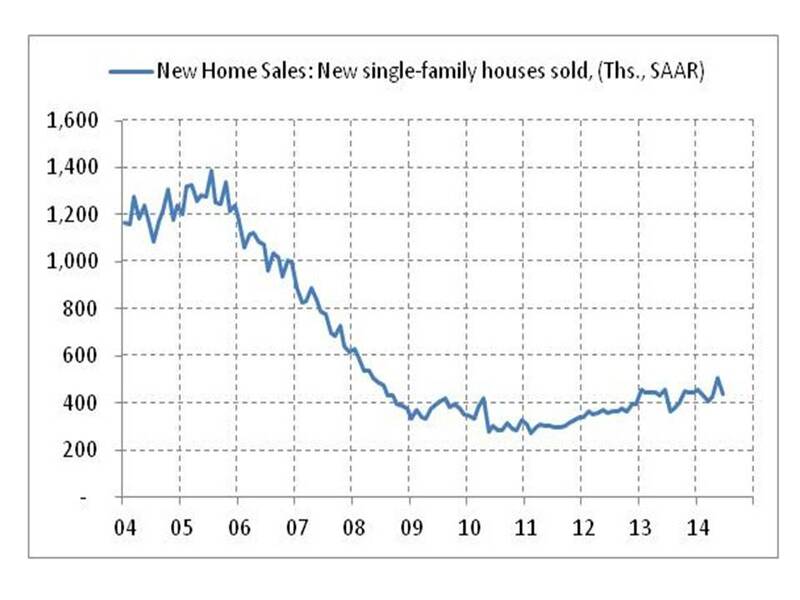 When I look at the chart for new home sales, I see a gradual trend of increasing new home sales starting towards the end of 2010 until now. Yes, there have been ups and downs but overall it appears to be slowly increasing. We may not be where we want to be or need to be for a healthy economy and housing market. We are making progress, it’s just very very slow progress.